It's very rare that Hanukah falls on Thanksgiving. But this year is one of them. Since we are grateful for the freedoms that America has given us, I combined the symbols of Thanksgiving and Hanukah into this Thanksgiving Menorah. The turkey was painted by Rabbi Michele Medwin. The brass candle holders are standard menorah inserts and are 12mm in diameter. 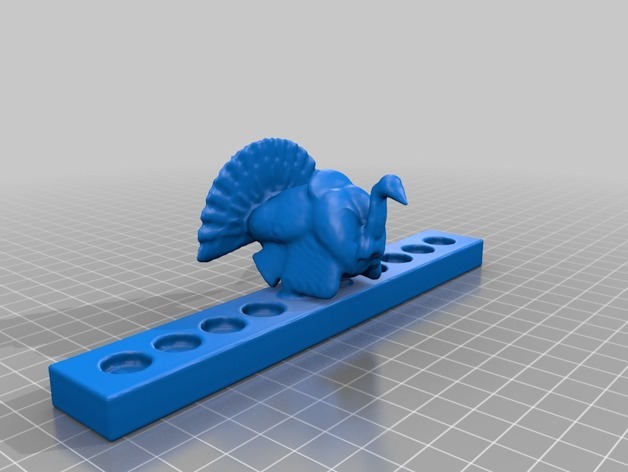 And finally, this menorah would not exist without Freckles' Turkey Gobbler that was just posted.I used MakerWare to prepare the file, a MakerBot Replicator2 with the MakerWare Standard slicing defaults (exceot number of shells) and the following settings with white MakerBot PLA to do the printing: Infill = 10% Layer Height = 0.200 Shells = 1 (only change from Standard) Feedrate = 90 Travel Feed = 150 Temperature = 230 It took just 2 1/2 hours to print at 165 mm wide.